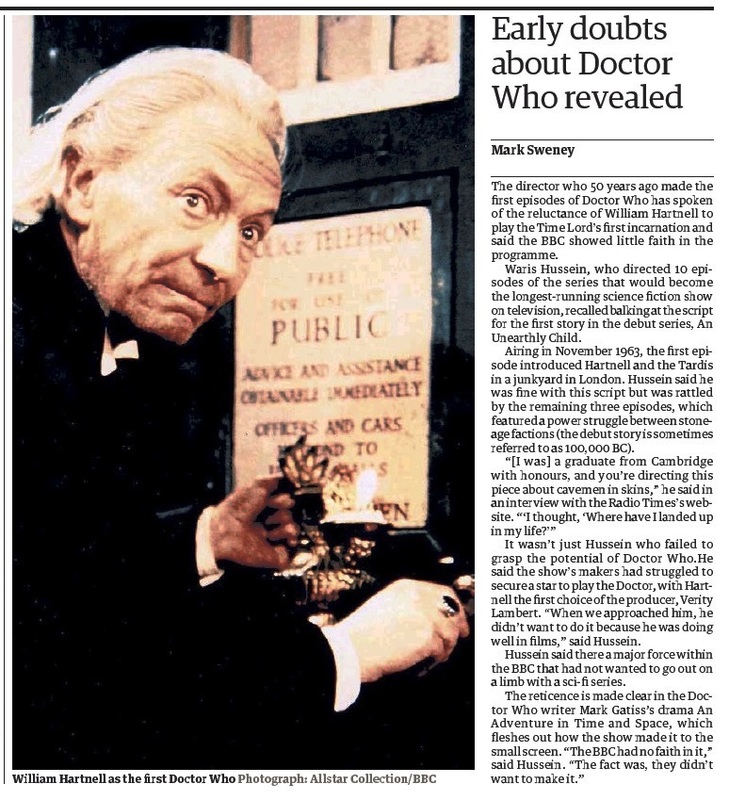 The director who 50 years ago made the first episodes of Doctor Who has spoken of the reluctance of William Hartnell to play the Time Lord's first incarnation and said the BBC showed little faith in the programme. Waris Hussein, who directed to episodes of the series that would become the longest-running science fiction show on television, recalled balking at the script for the first story in the debut series, An Unearthly Child. Airing in November 1963, the first episode introduced Hartnell and the Tardis in a junkyard in London. Hussein said he was fine with this script but was rattled by the remaining three episodes, which featured a power struggle between stone-age factions (the debut story is sometimes referred to as 100,000 BC). "[I was] a graduate from Cambridge with honours, and you're directing this piece about cavemen in skins," he said in an interview with the Radio Times's website. "'I thought, 'Where have I landed up in my life?'" It wasn't just Hussein who failed to grasp the potential of Doctor Who. He said the show's makers had struggled to secure a star to play the Doctor, with Hartnell the first choice of the producer, Verity Lambert. "When we approached him, he didn't want to do it because he was doing well in films," said Hussein. Hussein said there a major force within the BBC that had not wanted to go out on a limb with a sci-fi series. The reticence is made clear in the Doctor Who writer Mark Gatiss's drama An Adventure in Time and Space, which fleshes out how the show made it to the small screen. "The BBC had no faith in it," said Hussein. "The fact was, they didn't want to make it." APA 6th ed. : Sweney, Mark (2013-10-17). Early doubts about Doctor Who revealed. The Guardian . MLA 7th ed. : Sweney, Mark. "Early doubts about Doctor Who revealed." The Guardian [add city] 2013-10-17. Print. Turabian: Sweney, Mark. "Early doubts about Doctor Who revealed." The Guardian, 2013-10-17, section, edition. This page was last modified on 17 January 2014, at 23:43. This page has been accessed 769 times.